Modern Family is at its best when the writers manage to seamlessly weave together storylines featuring the three families, usually wrapping things up with a heartstring-tugging voiceover, something that could be corny but somehow works. The warm and fuzzy feeling comes out of nowhere; I'm sitting on the couch, thinking that Luke running into a screen door reminds me of something I saw a sheepdog do once, and suddenly I'm getting a little verklempt. I wouldn't watch a series that consisted solely of "aren't families crazy and also wonderful" moments, but a minute or two each week is nice, especially when it follows a good amount of laughter. The three threads of "Unplugged" don't intersect much, if at all. That isn't necessarily a bad thing, but in this case it made for an episode that felt rushed. Juggling plotlines is easier when they overlap organically, or if everyone is in the same location. This week I sometimes felt like I was watching three different shows. First up: Gloria and Manny are being kept awake by the neighbor's dog. Jay sleeps through it, because he has "old ears." Gloria confronts the neighbor, who counters that he never complains about their parrot — aka Gloria shouting "Jay!" Gloria "takes care of" the pooch, and Jay fears puppycide, because his wife has a history — she once hacked the head off of a rat and left it near the trash "as a warning to the other rats." Things take a weirdly dark turn, with Manny and Jay playing CSI in the garage, looking for "dog parts" on Gloria's shovel, but all Gloria did was send the dog to a farm. It was surprisingly typical sitcom fare. Next, Mitchell discovers on his morning jog that "all the children are gone" because they're in pre-school; he and Cam panic because they don't want Lily to become the "only underachieving Asian in America." When they call Claire for help, they're too upset to handle any sarcasm; when Claire suggests they buy Lily a Blackberry, Cam replies "she doesn't have the dexterity for that!" It's a condensed version of middle-class parental pre-school panic. There is some good stuff here, such as the receptionist telling the boys that they are "Diversity times 3" and therefore highly sought after pre-school parents. Still, more sitcommy than usual. And finally, the titular topic: Claire is annoyed that her family is constantly wired into various electronic devices because "families are supposed to talk." She says that they need to unplug, so Phil, because he's a putz, suggests a contest to see who can stay offline the longest, complete with prizes. Haley's prize is a car, so of course she wins, tricking Phil into thinking that she was talking to her friends on a phone she carved out of a bar of soap. Phil's big line, "we just got Shawshanked", is a pretty weak payoff to this section. 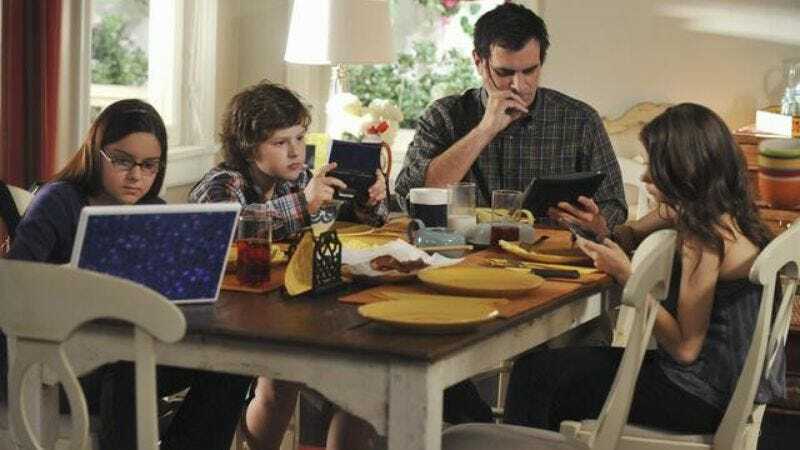 Modern Family has a good history with gadget-themed gags, like Phil's iPad obsession or Jay's crushed "electronic reader thing", but this time it felt very generic. The first few minutes of the show this week were particularly funny, but it ran out of steam quickly, which was strange. Modern Family is a pretty reliable weekly half-hour comedy. Some laughs, a little heartstring tugging, maybe Luke runs into something again. None of the plotlines felt finished, and each left some potentially amusing moments on the table. Did we really need to see the rest of Cam botching Lily's interview by pretending to be part Cherokee? Not that it wasn't amusing, but the coda felt like overkill. The process of getting a toddler into pre-school has tons of comic potential — Mitchell writing an essay, anyone? Instead Cam says "maize" four or five times. What was really missing at the end was what we've come to expect from this show — a theme of some kind, usually one that is wrapped in emotion. The closest we came to verklempt was when Jay books a trip to visit Gloria's village in Colombia, which could end up being interesting but was totally glossed over. Looking back over Donna's writeups of the first season reminded me that there were weak spots there as well. Hopefully this is a hiccup/Emmy hangover, as opposed to the inevitable leap over a deadly sea creature. I don't think it will ever quite get there, but Gloria was dangerously close to becoming Charo this week. "She's always had a certain comfort level with… killing." Jay is more willing to defend Gloria to the rest of the world than the other spouses are. When the neighbor shows up and accuses them of doing something to his dog, he expresses outrage, slams the door in the guy's face, and immediately asks Gloria "what did you do?" Compare that with Phil completely undermining Claire by turning the unplugging into a contest, or Mitchell asking the pre-school director "what if I were a single dad?" I suppose this makes sense, since Jay's is a second marriage, and Gloria is, you know, hot. Putting a show's best joke in the promo is stupid. Usually I watch via Tivo, so I never noticed this idiocy. The joke was "Disabled inter-racial lesbians? I did not see that coming." It wasn't as funny the second time, even though they threw in "with an African kicker". "Don't most kids drink soda?" "Who knows what they do?" "Don't take this the wrong way, but I have almost no faith in you."